From attracting and retaining donors to organizing fundraising events and campaigns, the operational challenges that come with running a nonprofit are varied and abundant. Just as in the business world, maintaining relationships and revenue streams are vital to survive, but in the world of nonprofits the pressure to do so in an efficient, cost-effective manner – looking after those precious donations made in good faith – is perhaps even greater. Thankfully, there is a wide array of software tools to help nonprofit organizations with this very challenge. While some traditional CRM platforms may work for charities as they do with businesses, we’ve focused on software specializing in supporting nonprofits. Let’s take a look at the best on the market right now. NeonCRM puts all your data and tools in one place, helping nonprofits to improve efficiency and organization so they can “focus on the work that really matters”, to quote the NeonCRM team itself. Many of the platform’s creators come from a non-profit background which means they understand the administrative and operational pain points of running such an organization, and should help them design a service catered to these specific needs. Users are able to create online forms, engage donors, plan events, manage members, track volunteers, and get insights from built-in metrics dashboards. The platform is comprehensive and pretty straightforward to use, but if problems do pop up, a host of tutorial guides are on hand to walk you through any issues. 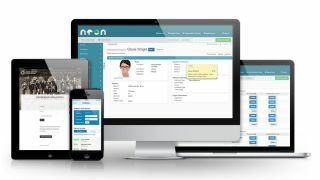 These are particularly useful in the early stages of getting acquainted with the NeonCRM platform. The price point – starting at $50 (£37) a month – may perturb smaller nonprofits, but this is not the most expensive offering of its kind, and comes highly recommended if budget allows. A wealth of features are on offer here, including a fully customizable dashboard, customizable reporting, constituent and contact management, the creation of acknowledgment messages and receipts, integrations with other software platforms you may be using, and customized, trackable mailings. The automatic categorization of donors (top donors, most active, and so forth) is a particularly handy feature, enabling users to home in on certain targets without sifting through reams of data to identify them in the first place. With so many tools on offer, it may be worth utilizing the extendable free trial to fully get to grips with the platform and make sure it’s right for the needs and skillset of your staff. A further boon is a user-friendly design, plus a heap of video tutorials to help the unacquainted acclimatize to the system, and make good use of its numerous features. CharityTracker enables different charitable organizations in the same community to collaborate with one another to improve the efficiency of their services. The creators came up with the idea for the platform off the back of the Hurricane Katrina relief effort in 2005. They noticed the scarcity of communication between different agencies trying to help displaced families in their home town of Florence, Alabama, which led to duplicated operations and poor management of resources. CharityTracker address these issues by enabling users to communicate in real-time – with each other, and with their communities. Features include a shared client case database, tracking and reporting, post bulletins and referrals. An extremely easy-to-use interface is one of the key plusses here. Navigation across different features is simple, which should save time training users. With many of these users potentially being volunteers with little knowledge of IT and data entry, this is an invaluable aspect of the platform. Its round-the-clock tech support is excellent too, so any problems that do arise should be nipped in the bud swiftly. For the data-heads who like to really get under the bonnet with their analyses, the reports may seem a little limited and cumbersome, but there is little else to fault with this well-priced service. Bloomerang helps nonprofits reach, engage and retain donors with its feature-packed platform. The company claims to have worked with “high-level thought leaders in philanthropy” to create a service that makes it easier than ever to build strong relationships with donors. The software’s core features include a dashboard that displays the organization’s donor retention rate along with suggestions on how to improve that, as well as future incoming donations. Users can also manage reports and accounts, while a social media hub monitors what constituents may be tweeting about your organization. It’s a shame Facebook and Instagram aren’t enabled, but lots of platforms don’t have this tool built-in at all, so we’re not complaining. Design is a strong point, with campaign progress showed as soon as you log in, while a clean, user-friendly design is employed throughout. You don’t have to be a software expert to make use of the platform, and it’s also been optimized for mobile for those who wish to log in on the move. Bloomerang boasts an impressive array of features but it is slightly less customizable than other services, which can be frustrating when trying to tailor the platform to the specific needs of each user within the organization. Given the higher price point demanded here, this is something of a drawback. DonorPerfect is a one-stop-shop for fundraising and donor management. It promises to “supercharge your nonprofit’s fundraising initiatives and cultivate your most valuable relationships” via its software platform. The roster of features include the ability to manage constituent contacts and donor development, send personalized communications, report and analyze results, integrate with other products and services, as well as being able to collect donations and information online. A standout feature of DonorPerfect is its extremely attentive support team. Unlike many other services, there is always somebody ready to help at the end of the phone. Sometimes scanning tutorials just doesn’t answer your question, and long waits for assistance can be frustrating, so the ability to speak directly to someone about an issue is a strong selling point. DonorPerfect doesn’t have all the bells and whistles of other services we’ve covered here, but it remains very comprehensive, and only really hard-core users will exhaust the options at their disposal. Operating on a slightly smaller scale? Then perhaps Continue To Give is the platform you need. With pricing starting at $30 (£22) per month, this service helps small to medium-size nonprofits collect donations across multiple avenues via the web, email, mobile, and social media crowdfunding. Wild Apricot is an all-in-one membership management solution which already serves over 16,000 associations, nonprofits, and clubs. Key features include full membership database management, a drag-and-drop website builder (including easy integration with your existing website), online event registrations, automated emails and much more. Focusing on events and volunteer organization, InitLive enables users to efficiently manage their teams. The cloud-based web platform boasts tools for event planners to recruit, assign staff, copy shifts, and reuse or export data. DonorSnap allows fundraisers to capture, organize and store donor contacts effectively. Using a customizable database with user-defined fields, you can track relationships and affiliations, manage memberships and accept event registrations.